19-23 High Street, Kingston upon Thames, Surrey KT1 1LL. Henry Olonga is very much more than a well-known Zimbabwean cricketer. A talented athlete and rugby player, he is also an accomplished singer and speaker but it is for his brave stance with Andy Flower against the brutal Mugabe Regime during the World Cup in 2003 that people tend to remember him. Make no mistake: that stance left him with little alternative but to flee his adopted country for his own safety and this moving book chronicles those events with Henry writing how a fortuitous World Cup match when rain took Zimbabwe into the Super Six stages led to his flight being made easier. Henry writes about his religious beliefs and throughout this book people are very generously spoken about. We learn that he was born in Zambia, moved to Kenya before settling in Zimbabwe. His description of boarding school life may well strike a chord with those who attended public schools a generation or so ago and he modestly admits through the book that he could be an erratic cricketer but, on his day, a match-winner. His first Test saw him become the first black cricketer to appear for Zimbabwe, the youngest to appear for Zimbabwe, a wicket in his first over and which finished with him being called for throwing. All this as an eighteen year old. Henry has made a thorough study of Robert Mugabe and his research goes into great detail about Mugabe's rise to power and how he initially admired him until the realisation that things were going badly wrong within Zimbabwe. Undoubtedly, Henry's knowledge and understanding of this situation makes his story even more compelling. The details of what led him to lodge his peaceful protest are detailed in one chapter which very clearly shows the pressures involved in taking such a stance. There are many other issues covered within this book: the absence of black cricketers in the Zimbabwe team, how he met his Australian wife, his family background and an alarming account of how he was kidnapped and his car taken. 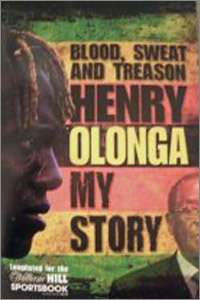 What is clear, though, is that, whether as a sportsman, singer or commentator, Henry Olonga is not only a tremendously talented man but a man refreshingly of great principles and anyone, whether interested or not in cricket, should read this tremendous book.